While we are on the subject of airline terminals, and to pictorially document my return home yesterday, here is a photo of Nice airport’s terminal 2, taken from the jetway. The shape very much reminds me of an upside-down Gugelhupf mold, the kind my mother and aunts used when baking this tasty cake. 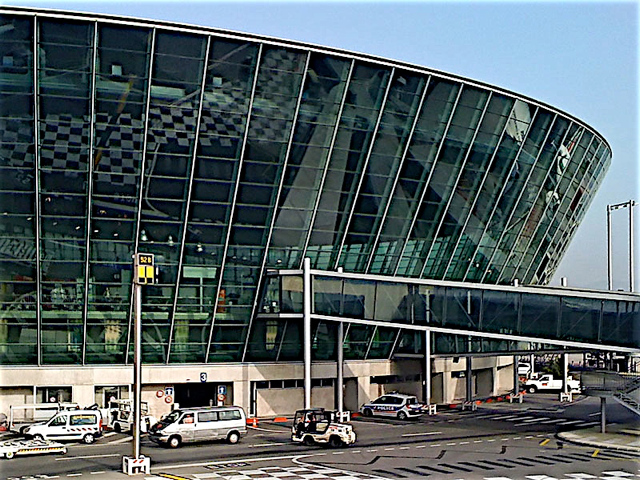 This relatively new terminal opened in December of 2002. Nice is a two-runway airport; the southern runway, the one furthest out to sea, is 3.2 kilometers (2 miles) long while the shorter runway measures 2.7 kilometers (1.7 miles). It was moved further south to make space for more aircraft parking in 1999, all without interrupting the considerable airport traffic: in 2008, there were 183,612 aircraft movements (takeoffs and landings), more than 500 per day.